If someone asked you what determined the learning ability of a horse, what would you say? Are some horses better, or worse, learners than others? And can we influence the learning ability of our horses? A horse’s ability to learn is largely dictated by his past experiences. Has your horse been able to explore, with or without a rider, circumstances to find a right answer, or has it been micromanaged and forced into a specific answer? Dr. Peters explains that a horse that’s exposed to a myriad of experiences has extensive dendritic fields (neuron-to-neuron connections in the brain), therefore increasing decision-making and learning capabilities. Consider a horse that has been stalled or kept away from other horses for most of his life compared with a wild mustang that has lived in a herd environment. A stalled horse likely hasn’t had the opportunity to interact with other horses or gain stimulation from varied environments. On the other hand, the mustang, or even a turned out ranch horse, is in tune with herd dynamics and is an expert at negotiating adverse terrain. These two horses represent two very different learning environments and have two contrasting dendritic fields. The dendrites in the stalled horse’s brain might resemble a pruned tree with very few branches, while the dendrite connections in the mustang’s brain might look like a large fig bush with vast networks of branches. These special forces horses are able to operate from the same place mentally as the mustangs. That is, they’re able to relate new experiences to past experiences, which gives them the sensitivity, desire, energy, and a to accomplish new tasks. The thing about learning is that it can happen with or without our supervision. 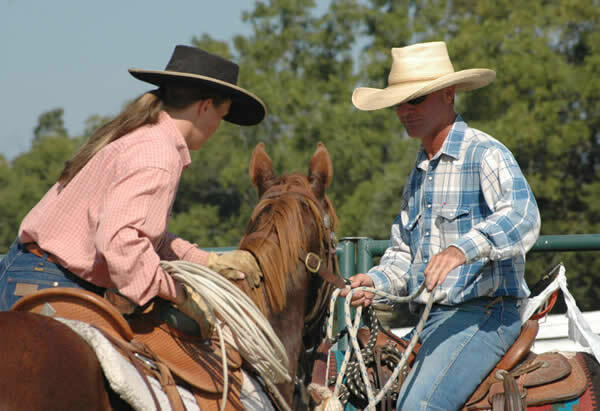 We might think that we need to be present to drive home a lesson with our horse, like creek crossing or trailer loading. But, the truth of the matter is that learning often stems from a horse’s curiosity. Take a creek crossing, for example. While some horses might walk across with no issue, others might avoid the creek like the Loch Ness Monster lying in wait, just under the surface. Let’s imagine first how this might play out if the nervous horse is without human supervision. He might give the creek the hairy eyeball at first, or he may even take a drink while leaving his feet firmly planted on the bank. Suppose then that he stretches his neck out so that his nose drifts toward the middle of the creek so he’s able to explore. Imagine now that his foot slips from its dry, land-loving position, splashing into the creek. The horse would likely startle and he would hop back to “safety.” After a moment, his curiosity would regenerate, and he’d eventually find himself inching across the creek. Of course, this wouldn’t happen if he didn’t allow his curiosity to test his limits. In order for the learning to happen, the horse needed to be curious, pushing his comfort zone. Our horses learn when they become curious or in a slightly stressed, alert state. When the curiosity is satisfied or the alertness retreats, the horse returns to what is called homeostasis (comfort, or the scientific term that means a neutral state) and is greeted with a dose of dopamine (a feel-good chemical commonly associated with licking and chewing that comes about when the horse has been relieved from stress). Horses, and humans, enjoy the dopamine hit that comes from learning. It’s like the best piece of chocolate money can buy, only free and without calories! As riders, we can facilitate this natural learning process so that we achieve our goals while our horses get their treat. The key is to work with your horse’s natural behaviors. Let’s go back to the creek, only with a rider this time. Let’s say the horse gets to the bank of the creek, then stops cold in his tracks. Some riders might get frustrated and give up, others might kick, jerk, and finally trudge across. If the pair makes it across, both horse and rider might be stressed to the max. Remember, the horse’s natural behavior tells us that the horseman should push the horse to the edge of his comfort zone, pausing while the horse explores each new frontier to offer reward (in the form of a dopamine treat!). Let’s dissect the creek crossing further. A horse doesn’t see life the same way humans do. While they have a very wide field of vision, about 300 degrees, vertically their vision is very limited. Horses also can’t see directly in front or behind their bodies. This means that the horse will need to move his head up and down, left and right to get a good look at the creek. (Hint: Also keep his need to control his own head in mind while traversing difficult or steep terrain. He’ll need to get a look for sure footing!) He might want to get his nose close to the creek, sniffing and touching it with his vibrissae (his whiskers are actually powerful sensory organs that send signals to his brain!) while collecting as much information about his surroundings as he can. By allowing him to explore while challenging his comfort zone and offering breaks to reward progress, the rider is building the horse’s confidence. The real reward, though, comes as dopamine. The exploration, along with the reward, makes the learning process a positive experience. Think about the countless old adages about getting out of the comfort zone— “Life begins at the end of your comfort zone,” “Can’t steal second with your foot on first,” etc. It’s the same for horses. They need to be curious, to explore and to leave their comfort zone for learning to happen. If he never leaves his comfort zone, there’s no more to life than what he knows already. That goes for the joy of learning, and the dopamine hit, too. “If you never get a horse out of his comfort zone, he’s never going to seek comfort,” Black said. Teaching the horse to expand upon his comfort zone, and learning to seek relief while outside of his comfort zone, also comes in handy when dicey situations pop up. Let your horse learn. Give him permission to explore. He’ll build his dendritic fields, find pleasure in learning, and gain the confidence to explore and negotiate new challenges. For more information about Evidence-Based Horsemanship, check out upcoming seminars with the authors, the book or the DVD.